I was booked into the Beacons Ultra for a few reasons. It was relatively close to home which is pretty unusual. It was at a suitable date for an end of season race. It wasn’t too long at 45 miles. The fact that this race seems to fill really fast also attracted me. People were obviously pretty keen to be in this race. Months ago I had set up a reminder on my computer to tell me when the race was opened for entries to make sure I got my place. I got my place then pretty much forgot about it till after Spartathlon. I then realised that I would be needing a car to get there as there was no nearby train station. Luckily, Louise came to the rescue by borrowing a car from a friend of hers. Phew! The race started at 0730 and I of course needed to be there before to register, which meant another very early morning! 0430 I believe. We got there with plenty of time to register which made a nice change to my almost standard seat of the pants timing! How relaxing! We sat in the hall and watched the place slowly fill. During the briefing that followed, Martin the race director, informed us of some of the people who were racing. There was some real talent here! Today was going to be a fast day. Well, fast for some, I on the other hand was not going to take it easy, but was not expecting anything as I was here for my end of year bash! The race began. I was near the front and instantly the pace was fierce. The first 5-6km were on a canal so it was flat and the footing was good. I thought I may as well stay with it as long as seemed sensible. Mark, the previous few years winner, had shot ahead at an incredible pace. I left him to it. I was pretty much on my limit here. The route was two laps of a 22 mile circuit. All I knew was that after we left the canal we went up a hill and down the other side. I knew nothing else about the course. I wasn’t wearing my Garmin and these days I don’t use my heart rate monitor so was running completely by feel which felt pretty liberating. Soon we pulled off the canal and instantly began heading upwards through a field. The weather was really mild for the time of year, so much so that I was just wearing a t-shirt and shorts. I wasn’t even wearing gloves which is pretty good seeing as I have really poor circulation in my hands. As we headed up through the fields climbing over stile after stile, I saw as I looked up that the tops of the hills were shrouded in the low cloud. We were heading straight into it! The climb continued for quite some time before we eased into the cloud. It was really thick like pea soup! Visibility was down to about 20 metres so almost instantly, I lost sight of the other runners. The temperature also dropped considerably and my hands where feeling it, but I decided to hold off on getting my gloves out as hopefully the temperature would rise as I came down out of the cloud. This climb was a lot bigger and steeper than I imagined, but I was enjoying the severity for the warmth it provided and the downhill that would follow. My downhill technique is nothing special, but there are definite improvements. I don’t lose any real time now. In fact I will make up time on some people without expending any more energy! Soon after hearing some voices, three figures and a tent came into view ahead. As I approached I realised that this was the cp at the top of the hill. I passed them and begun the downhill. It was a pretty fast downhill being relatively non-technical. Lots of fun but soon over. Fortunately as I came out of the cloud it got warmer and my hands warmed up again. The rest of the course was lots of fun and pretty varied. There were some really good downhills that were really technical due to some really awkward footing. I was having lots of fun on these and was also managing to stay upright which was quite surprising seeing as I was pushing it right up to the limit of my ability! It was pretty wet, muddy and therefore slippery in places, but again this just added to the fun. I passed through more cp’s but didn’t stop once, wanting to keep the pace high. I was feeling pretty good. Soon I was on a quiet country road, and still keeping a reasonable pace. I was tiring, but nothing unusual. I knew I must be fairly close to the end of the first lap as I crossed a bridge that spanned the canal then dropped down onto the path. There was still a few miles from the end though and it did seem to drag a bit as I starting feeling the first signs that I hadn’t kept on top of my nutrition. As I looked behind I noticed around 4 or 5 runners quickly gaining on me. I accelerated a little then realised that I should just stick to my own pace, and let them pass me. They did so surprisingly quickly leaving me for dust. I was now beginning to see that I needed some food, electrolytes and water in me and fast too if I didn’t want to just burn out only half way through! I slowly begun to load myself up but continued to crash. The second time up the hill wasn’t too bad but I just lacked the zip I should have had had I looked after myself better. Never mind. As long as I focused on getting back on track then I knew from experience that I could still have an ok race. I laboriously made my way down the descent and then hit the woodland road that is pretty long and this is where I hit rock bottom. I was staggering and struggling to run even though the footing is great and it was pretty flat. I was holding onto the hope that soon the food and drink I’d slowly been consuming would start taking effect. As I came out of the woods and begun the steady climb up into the cloud again I began to feel stronger. Nothing amazing, but a definite change, and with this my confidence grew. I now kept eating and drinking. I was in 9th place, and I would be happy if I could hold that, but I had no idea how far the other runners ahead or behind me where. I now felt how I would expect to feel after 30 odd miles. I now just had to keep the pace going for another few hours and it would be done. It was good to not have to concentrate at all on my direction having only been on the trail a few hours previously. I was pretty strong and didn’t see another soul until I was back on the canal for the final time with only around two miles to go. I stopped for a call of nature and looked behind me. I couldn’t see very far along the canal due to the bends, but there only a few hundred metres behind was a runner! I hurried up and bolted. I didn’t look back till I was on the road with only a few hundred metres left. He was nowhere to be seen. I crossed the line in 9th place in a time of 7hrs 20mins. Not as quick as I was hoping, but that will serve me right for not looking after myself. Overall though I was pretty happy with it and it was a really fun and pretty course which I would love to return to. The next day, Lou, James and I were entered into the Bath Skyline 10km, an off-road course that was just down the road. I was pretty stiff, but thought I’d just turn up and jog around. As soon as it started I found myself near the front and just went for it. It was an excellent cross-country course that was really muddy in places. Again, it was a two lap race that really was quite testing, pushing me to the limit at every second. So much for the recovery run! Who was I kidding! I finished in 7thplace in just over 44mins. I felt pretty good at the end too! James came in 9 minutes later and Lou just missing out on breaking the hour mark. This was the first of a new series which I’d say was a real success and it’s a shame that I won’t be able to make the next one. Then again the reason I can’t make it is because I’m doing a race in the Lake District. The next weekend I had a go at something that caught my eye quite a while ago. The Green Man Challenge is the completion of the Community Forest Path in 24hrs. The CFP is a loop that circles the whole of Bristol totalling 45 miles in length. It is named the Green Man Challenge as it begins within Ashton Court at a large stone carving of the Green Man. The whole idea is designed and governed by the Gaveller, otherwise known as Chris Bloor. He came and met me at my chosen start time of 0630 to see me off. We chatted briefly before I ran off into the darkness through the deer park. Before I continue, I will just tell you about the preparation that went into this run. Well, I printed out some strip maps that were designed for people to do recces with and I had an OS map that wasn’t great as it was in the wrong scale for any real accuracy in tricky sections. I barely even looked through the route properly. I had read a few other peoples reports and most people had recced the route. Some thoroughly! I made it out of Ashton court and was soon heading up the hill heading towards Dundry. Soon I was off course and was forced to crawl under some barbed wire before being back on the trail. As I ran along the trail at the top of Dundry towards the village, the sun was rising over the trees setting the clouds alight. The ground was wet, but it looked as though it was going to be a great day. I really was enjoying running around the city being surrounded by beauty yet being close to it all the time. The path threads it’s way through the rural areas and sometimes through built up areas, but always utilising what green areas there are. It is a really well thought out footpath. All was going pretty well till I got to Warmley where I got a little confused and ran in circles for a while before finding the trail again. I must admit that I did expect to get a little lost due to having not been over any of the course before, so even though I believed that I could beat the course record of 7hr20mins, I knew that everything had to be just right with no time wasting. Already I had wasted lots of time, but I was enjoying the path a lot. I next got disastrously lost around Kendleshire Golf course. Fortunately Louise came to the rescue here. She had decided to come and support me for the last half and it just so happened that she was pretty close when I was very confused. She found me running down a road and fed me a still warm sausage roll before pointing me in the right direction and setting me off again. Next point of confusion was not too far away near Hambrook. I then didn’t spend too much time on the CFP till I got to Around the Parkway area where Louise found me again. She this time refuelled me with a flask of rooibos tea and then rode beside me for a while which was really nice. Although I like to run alone it doesn’t mean that I don’t like the company. She stayed with me right up to Aztec West where it again turned to bike unfriendly path forcing us to part again. I then travelled trouble free (amazingly!) all the way to Easter Compton where Louise was waiting for me. I didn’t hang around, except to get my torch out as the night was closing in. I made my way up and over Spaniorum Hill where it was really marshy. I had been going for many hours here yet was feeling really good. Even though I had been just running around in circles all day, I was really enjoying it. When I arrived in Henbury, Louise was waiting for me again. This time I was fed a sandwich which vanished before I ran off through the streets. The next challenge was getting through the Blaise estate. I saw it as a potential challenge as I had read that others had got lost here. What chance did I have! Sure enough, I lost it and ended up on the road before heading straight back into the woods to tray and intercept the path. I knew I was heading in the right direction so just continued, hopeful that I would exit the woods where Louise was waiting. Needless to say that I came out close to Louise, but not close enough! Around another wasted half an hour later, we met up again before I ran off through the golf course. From now till the end was free from error. When I got to the Downs, I called the Gaveller as promised so that he could meet me at the end. I also let Louise know where I was. The last section was really nice and the night view that suddenly appeared of the suspension bridge was stunning. As I crossed the bridge, Louise caught me up so we could finish together. Ashton Court was locked when we arrived so we leapt over the wall and made our way towards the light of the Gaveller who was already waiting for my arrival at the Green Man. It was good to be done. Even though it had been pretty disastrous navigation wise, I had had a great day running around like a headless chicken sliding around in the mud and was really feeling pretty good seeing as my Garmin informed me that it had begun 13 hours ago! Garmin upload for your entertainment! We chatted with Chris for a few minutes in the dark at the Green Man stone Carving I had left early that same morning. Chris had already offered me a lift back but I wanted to run. It only felt right for this to be a true door to door venture. I will of course run the CFP again and probably many times as it is on my doorstep and is a great distance for a long day out. I’m not sure that it will ever be quite the mad adventure that this was though! I next had plans with Drew again to do a recce. This time the recce would take us to the North York Moors, on the Cleveland Wayto prepare for the Hardmoors 110 we are both entered into next year. The race is the Cleveland Way in it’s entirety. All 110 miles of it. I’ve heard some good stuff about this race. It is supposed to be really tough. I like to if possible recce any route that will be long enough to take you through the night so to take up this opportunity with Drew was valuable for race confidence. I got the train to Coventry where Drew picked me up and we drove on up to the edge of the North York Moors where Drew had booked a room for two nights at a hotel. We didn’t get there till after 10 so just chilled out in our room and sorted out our kit for the next days early start. We had booked breakfast for 0515 and the cook serving us looked like he wasn’t going to wake up for at least another two hours. We had our breakfast then drove to Thirsk where we left the car and got into a taxi and directed it to Helmsley. This is where the end of the Cleveland Way is situated, and where Drew and I spent 5 minutes hunting for it! The weather was atrocious with very strong winds which would be a lot stronger when we got up onto the exposed moorland. We ran off up the path skirting a woodland in complete darkness. We decided to start in the dark so that we could have every bit of daylight we could get. The path was really easy to follow and for around the first 30km, although it is actually slowly climbing for a lot of it, is actually really pretty easy running. We were going well and I was feeling great. Drew had mentioned that he hadn’t felt great on the drive up but seemed to be going well at the moment. Our target for the day was Saltburn by the sea, which would take us onto the coastal section and the half way point at 55 miles. I was carrying the map, and as I looked ahead to what lay ahead, I noticed that it got a little lumpier up ahead which would slow us down considerably. No problem. I get a bit bored with to much flat running! As the trail got more challenging, I kept noticing that Drew was uncharacteristically slowing down a bit. Drew and I have a pretty even pace so I knew that he wasn’t going well and slowed a little. This wasn’t a race. As we plugged away at the ups and the downs, the mileage was getting higher but not quick enough. Then as we got onto the open moorland towards Bloworth Crossing, Drew begun walking and said that he wasn’t going to make Saltburn, and that we were soon to be at Kildale where there was a train station. We decided that we would stop there and catch the train back from Kildale. We had covered 40 miles so had still done a pretty good recce! We arrived at the tiny village of Kildale and found the really nice and cosy family run tea shop. I had a couple bowls of soup and some coffee, whilst we waited for the train. After much waiting and a couple train rides later, we arrived back at the car and Drew drove us back to the hotel. We had checked to see what fell races were on the Sunday and discovered that the Eskdale Eureka was. It was 8 miles with not too much climbing. I felt pretty good but Drew sensibly decided to spectate as the weather was pretty harsh being very windy and only 2 degrees Celsius. I had a great race, really enjoying the madness of it. I of course did not know the route at all, but had some runners ahead of me who clearly did, and chose to follow them as they would just turn off the path and begin leaping through knee deep bracken and gorse as they tried to find the fastest route! 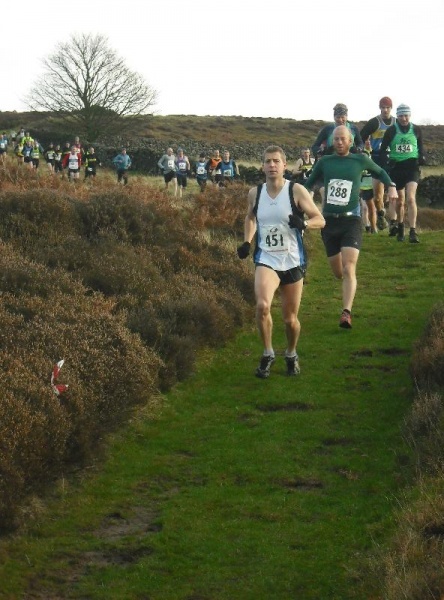 Fell racing is just so intense physically and mentally. I never imagined that running could be so exciting! I felt strong to the end and managed 9th place. 8 minutes behind the winner. My descending is definitely improving, and stuff like this will really push it to a different level. Overall a great weekend again. Shame Drew wasn’t feeling up to it, but I would say 40 miles is pretty good for feeling under the weather! Today is the 13thDecember and on Saturday I’m entered into the Tour De Helvellyn in the Lakes. The weather all around the country is abysmal at the moment and doesn’t look to be much better at the weekend so being the shortest Saturday of the year, could really be a tough one even though it’s just a 38 miler. I can’t wait to get back up to the Lakes. I will be running with my good buddy Dave again which is always a pleasure. Will write again soon to talk about Helvellyn. This entry was posted in Beacons Ultra, Cleveland Way, Community Forest Path, Eskdale Eureka, Green Man Challenge, Hardmoors110, Tour de Helvellyn, Woodwose by admin. Bookmark the permalink. You really do get the miles in Neil, great reports really enjoyed reading this! Thinking about the Green Man Ultra next year – wondering if anyone has downloaded courses on garmin connect. Could be useful. Def will recce in advance if interested in another outting?